In 2003, ISO 13485 became the standard quality management system for the design and manufacture of medical devices. Companies which demonstrate that their devices are effectively implementing and maintaining the quality requirements can be certified by the ISO. The standard applies to companies which design, manufacture, and assemble medical and in vitro diagnostic medical devices, as well as medical component manufacturers. Medical device companies which market their products to the international market will benefit most from compliance with the standard. Certain countries, such as Canada, stipulate that devices must be certified by ISO 13485. Compliance with these standards also goes a long way toward qualifying for the European standard. 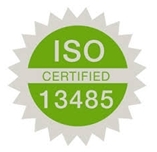 Companies with ISO 13485 certification can more easily meet the requirements of the European Medical Device Directive (93/42/EEC), In Vitro Medical Device Directive (98/79/EC) and Active Implantable Medical Device Directive (90/835/EEC). Although the US Food and Drug Administration does not formally recognize ISO 13485 certification, US Good Manufacturing Practices quality system requirements do overlap with the standard in many areas. Compliance with the standard requires documenting policies for record controls, internal auditing procedures, non-conformance controls, preventative and corrective actions, process and design controls, record retention, accountability and traceability. Risk management must be thoroughly documented and conducted throughout a product’s entire lifecycle, from initial concept to delivery and post-delivery. In the past, risk management was thought to apply only to the design and development phase, but the new standard has made it clear that it is an integral part of enterprise-wide management systems from design to post-sale. In addition to gaining access to new markets, ISO 13485 certification has other benefits. Compliance reduces operational costs by improving efficiency and highlighting inefficient processes. Consistent delivery of high quality products and systematic addressing of complaints increases customer satisfaction. Complaints, surveillance and product recalls are handled in a transparent manner and the standard is a proven commitment to quality. Gary Gelhaye, Quality Manager at Custom Fab Solutions says the reason his company opted to qualify for the ISO 13485 standard is to demonstrate to its customers that the company is committed to quality. In addition, CFS wanted to “improve overall effectiveness of the company. Most importantly, we wanted to broaden our customer base. In particular, ISO 13485 will open doors to the medical community.” CFS found that monthly quality objective metrics improved the efficiency of the company as a whole and improved quality performance across the board. Are you certified for ISO 13485? How has it benefited your company? ← How will robotics affect the healthcare industry?